As they have more than 100 years, the markets will bring the returns; our greatest value to you is to help you minimize and control the risks in your financial life so you enjoy more of your life. 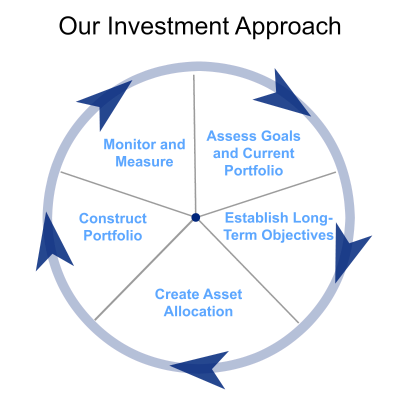 Utilizing a science-based risk assessment tool (Riskalyze), we analyze your objectives, current asset allocation and risk tolerance to see how well they are aligned. Based on your risk fingerprint and time horizon, we work with you to establish specific objectives including targeted investment returns. We determine how to allocate your portfolio among the various asset classes and investment options that will achieve optimal diversification targeting your expected return. Within the broader asset classes, we select the specific investment options to be used in constructing your portfolio. We monitor your investment portfolio and provide you with quarterly performance reports. At least annually, we conduct a complete portfolio review to determine if it is still aligned with your objectives and risk profile. If needed we will recommend that your portfolio be rebalanced to bring your asset allocation into alignment, or changed to meet new economic realities. Above all else, in our fiduciary capacity, we apply the same level of care that our clients would apply in planning, selecting, implementing and managing their own investments. Do You Really Know Your Risk Number?